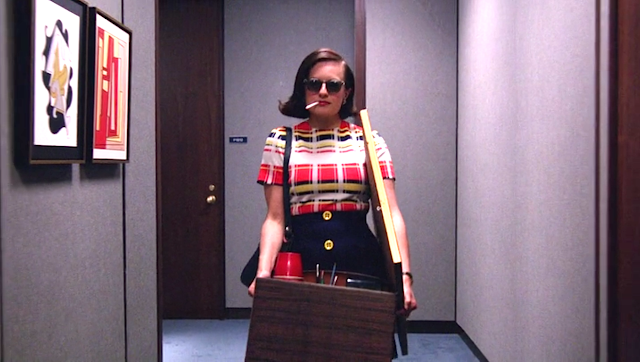 Every post about my day job must include a picture of Peggy Olson. Way back in March, I meant to write a post about what I'd learned in the year since returning to an office job. That post, like so many others, didn't happen. (But, like so many others, it still might! Don't lose hope!) In the meantime my work-anniversary passed, quietly and without fanfare. I don't write about my day job very often. No one really likes to talk about work when they're with friends. A job, after all, is a necessary evil. It takes up 40 whole hours every week, and by the time you're finished paying your dues you want to focus on something else - books, beers, the beach. If you have a problem and need advice, or had a success and want to celebrate, then yes - talk, share, vent. If you had a regular day where everything was fine and nothing out of the ordinary happened, let's talk instead about Stranger Things and our latest book club pick. It's only fair. That said, it seemed time to write a little update about my job - mostly because I got a promotion! (Hence my choice of that Peggy picture for this post.) A few weeks ago, one of my favorite coworkers was offered a new job out in California (she'd been telecommuting after moving with her military husband). Our marketing department is small (three people, including me) and she was really talented, so the hole she left was substantial - so substantial, in fact, that I was invited to step into it. I'm now the Digital Marketing Manager. I got a raise, and new business cards, and updated my LinkedIn profile, which are all weird corporate things that secretly bring me a strange sort of joy. You see, I'm a person who hasn't spent much time thinking about her career. I was never really interested in "leaning in," and I never wanted a corner office in a tall building. I didn't dream of becoming President of the United States (though I am super excited to vote for Hillz in November) and I would rather cut off my arm than be the CEO of anything. This isn't because I'm lazy or lack vision. It's just that my day job has always been a means to an end, a way to support the work that I am passionate about - my writing. As you probably know, fiction doesn't pay the bills, and life is a constant balance of trying to carve out enough time to make art and still afford groceries and rent. When it comes to leaning in, writing is the direction toward which I point myself. However! I happen to like my day job. I think digital marketing is fun and interesting. It's a different kind of storytelling, combining writing, technology, and psychology in ways I find fascinating. The work is challenging without wearing me down or zapping my energy. If I have to have a day job, and I do, then this one is pretty perfect. Which is why I'm excited for my promotion, for the chance to dig deeper into my field and add management skills to resume. To make a little more money and contribute to my company in a larger way. To look toward the future of marketing and try my best to not just keep up, but anticipate where it will go next. And, of course, to leave it all at the office so I can focus on what really matters in my off time - writing, writing, writing. It's a good balance, one I'm grateful to strike.